Taurus constellation lies in the northern sky. Its name means “bull” in Latin. The constellation is symbolized by the bull’s head, ♉. Taurus is one of the 12 constellations of the zodiac, first catalogued by the Greek astronomer Ptolemy in the 2nd century. The constellation’s history, however, dates back to the Bronze Age. Taurus is a large constellation and one of the oldest ones known. In Greek mythology, the constellation is associated with Zeus, who transformed himself into a bull in order to get close to Europa and abduct her. Taurus is known for its bright stars Aldebaran, El Nath, and Alcyone, as well as for the variable star T Tauri. The constellation is probably best known for the Pleiades (Messier 45), also known as the Seven Sisters, and the Hyades, which are the two nearest open star clusters to Earth. Taurus also has a number of famous deep sky objects, among them the supernova remnant Messier 1 (the Crab Nebula), Hind’s Variable Nebula (NGC 1555), the colliding galaxies NGC 1410 and NGC 1409, the Crystal Ball Nebula (NGC 1514), and the Merope Nebula (NGC 1435). Taurus constellation has been known since at least the Early Bronze Age, when it marked the Sun’s location during the spring equinox. It has been associated with the bull in many cultures and mythologies: Greek and Egyptian among other, and even going back to Ancient Babylon. Depictions of Taurus and the Pleiades star cluster have even been found in a cave painting at Lascaux, dating back to 15,000 BC. Both the constellation and the Pleiades have been known in many indigenous cultures and referred to as the bull and the seven sisters, which indicates a common origin for the names. In Greek mythology, Taurus is usually associated with Zeus, who adopted the shape of a bull in order to seduce and abduct Europa, the beautiful daughter of the Phoenician King Agenor. Zeus mingled with the king’s herd and, being the most handsome bull there, he got Europa’s attention. The princess admired the bull and, when she sat on his back, he rose and headed for the sea. Zeus carried Europa all the way to the island of Crete, where he revealed his true identity and lavished the princess with presents. The two had three sons together, including Minos, who grew up to be the famous king of Crete, who built the palace at Knossos where bull games were held and who also sacrificed seven young boys and girls to the Minotaur each year. Zeus later commemorated the bull by placing it among the stars. In the Epic of Gilgamesh, one of the earliest literary works from Mesopotamia, Gilgamesh faces the Bull of Heaven sent by the goddess Ishtar to kill the hero after he had rejected her advances. Gilgamesh is sometimes associated with the nearby Orion, another ancient constellation, and the two constellations are depicted as Gilgamesh and the bull in combat. 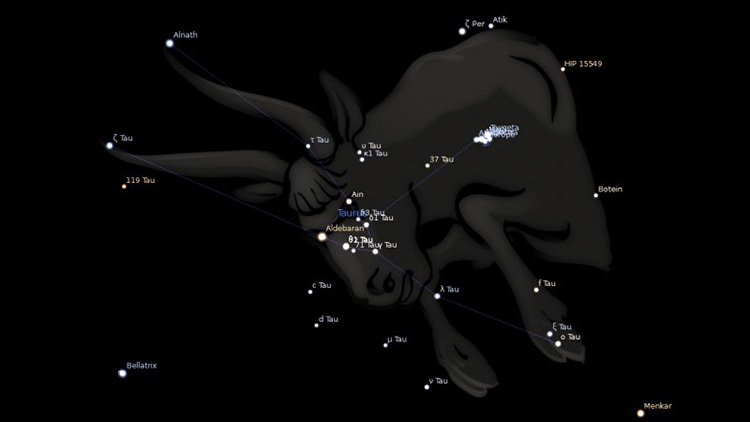 How to find the constellation Taurus in the sky? Taurus is visible to observers between latitudes +90° and -65°, and although found in the northern sky, it is still visible to observers located south of the equator during the southern summer. Look for Taurus toward the northeast of Orion, and southwest of Perseus, or alternatively locate the famous Pleiades star cluster (M45) halfway along the “back” of the bull, where it appears to be caught between Taurus and the constellation Aries. In the northern hemisphere, Taurus is best seen in the autumn and winter months, while in the southern hemisphere it can be seen in spring and summer. From northern locations, Taurus appears in the east from October to November just after sunset. During December and January it then gains elevation, to culminate during the first half of January, making this month the best to observe the constellation. Apart from the Hyades cluster that is said by some observers to delineate the face and horns of a bull, the shape of a bovine in the sky is not readily apparent. 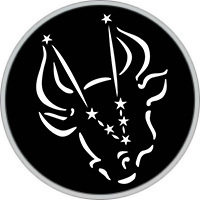 In fact, if it weren’t for the two bright stars Aldebaran and Elnath marking the “chest”, and “head” of the creature respectively, the “Bull” might be invisible to all but those with the most active imaginations.